The Blobfish is a deep-sea fish which inhabits waters just above the sea bed at depths of 600 to 1,200 meters (2,000 to 3,900 feet), off the coasts of mainland Australia, New Zealand and Tasmania. They have been described as the ugliest fish in the world, however, this popular impression is due to decompression damage to their jelly-like bodies, when out of their natural high pressure environment. The stereotype is also mainly from one single popular photo of a dead blobfish, that has experienced significant deformatity due to decompression. It’s the most common picture you’ll see of a blobfish, which resides in an Australian museum. They are members of the order Scorpaeniformes and family Psychrolutidae, which includes fatheads, fathead sculpins, and tadpole sculpins. Diet: Sea urchins, shellfish, mollusks, crabs, lobsters, microscopic bacteria, sea pens. Blobfish are pinkish grey in colour, and typically under 30cms (12 inches) in length, weighing around 20 pounds (9 kg). The flesh of the blobfish is mainly a gelatinous mass with a density slightly less than water. This enables the blobfish to float above the sea floor, with their mouths open, sucking in any prey that floats or swims in their direction. Their diet mainly consists of microscopic bacteria, and sea creatures, such as urchins, shellfish, mollusks, crabs, lobsters and sea pens. Little is known about the blobfish, as they are elusive and live in such deep waters of the ocean. 1. They were voted the worlds ugliest animal in a 2013 online poll. When the Ugly Animal Preservation Society needed a new mascot, they decided to put it to public vote. The blobfish was resoundingly named as the ugliest animal alive with 795 votes of 3,000, beating the proboscis monkey, the aquatic scrotum frog, and pubic lice for the top spot ‘honour’. However, the popular ‘ugly stereotype’ is rather misleading. 2. The blobfish actually looks like a completely normal fish in its usual environment. At deep-sea, they look like a typical bony fish. This pressured environment provides their gelatinous body mass with structural shape. I think it’s important to look at deep-sea fish in the correct context. They aren’t monsters or aliens, they are just animals shaped by very different conditions. A lot of our opinions about deep-sea fish stem from how we first discovered them, by dragging rough nets through thousands of meters of water. We learned a lot from these specimens but it also influenced our opinion of deep-sea animals. If I was out in space, blasted out of an airlock (a fish from 2000m experiences 200x this pressure change), dragged over the surface of the moon for kilometres (like fish are in nets) and then preserved in alcohol at very high gravity, I would look pretty ugly too! 3. Blobfish was first discovered in 2003, and immediately given it’s name. 4. Blobfish live in an extreme pressure environment and experience up to 120 times the pressure as on dry land. At this depth comparatively, human organs would be crushed under the sheer weight of pressure. 5. The blobfish has no skeleton, and little muscles. The flesh of the blobfish is primarily a gelatinous mass with very fine, soft bones, which allows the fish to survive at high pressure and float above the sea floor at extreme depths, without expending much energy. 6. They are related to the Blob Sculpin (Psychrolutes phrictus) species. This gives researchers clues about how the blobfish lives on the sea bed. 7. Blobfish do not have a swim bladder. Unlike most fish, deep sea fish do not have air-filled cavitites, which act as buoyancy and help with movement. They would collapse under sheer pressure at the depths they live. They rely on their jelly like flesh to provide the required support instead. 8. Blobfish don’t spend much energy moving around. They don’t actively hunt, due to their lack of muscles. As their jelly-like mass gives them a density lower than water at such deep pressures. 9. Blobfish have no teeth. Blobfish don’t bite, they have no teeth and very few humans will ever come into contact with them. They float around above the sea floor hovering up microscopic bacteria and sea creatures that appear. 10. Their only predators are thought to be human, with accidental capture in deep sea trawling nets. 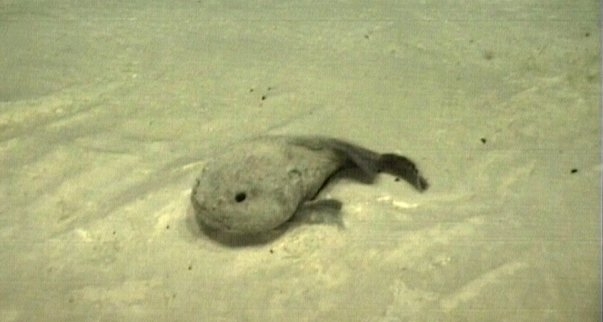 The rapid change in pressure is fatal for the blobfish, which is built for the high pressure deep sea environment only. They die out of the water instantly. 11. Blobfish are not considered a delicacy. They never make it to the dinner plate, unlike a lot of fish. This is mainly because they are very rare and there are far simpler fish to catch. 12. Nobody has ever documented a living Blobfish. Due to their extreme environment, humans have not been able to document them properly in the wild. Only a couple of rare underwater pictures have ever been captured. Nearly everything we know is based upon dead blobfish discovered in trawling nets. 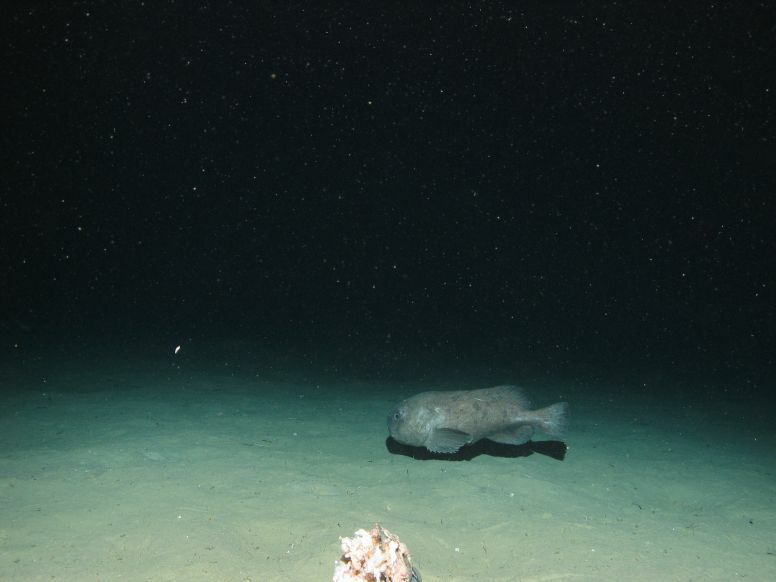 The photo below is thought to be a Western Blobfish, photographed by an remotely operated underwater vehicle (ROV) at a depth of approx. 1220 m, 70km off Barrow Island, North West Shelf, Western Australia. 13. Blobfish are rare and often claimed to be endangered. However, the IUCN has not studied them, and hence they are not currently classified. We have so few sightings of them that it would be hard to assess them. They represent the vulnerability of a lot of deep water fish, they are likely long-lived, slow growing and mature very late. By James Joel, via Flickr. “Dr Alan Jamieson, Senior Lecturer in Marine Ecology”, via Newcastle University. “You Have Been Lied To About The Blobfish This Whole Time”, via IFL Science. “Dr. Thom Linley”, via Newcastle University. “Blobfish (aka Mr Blobby)”, via The Australian Museum. 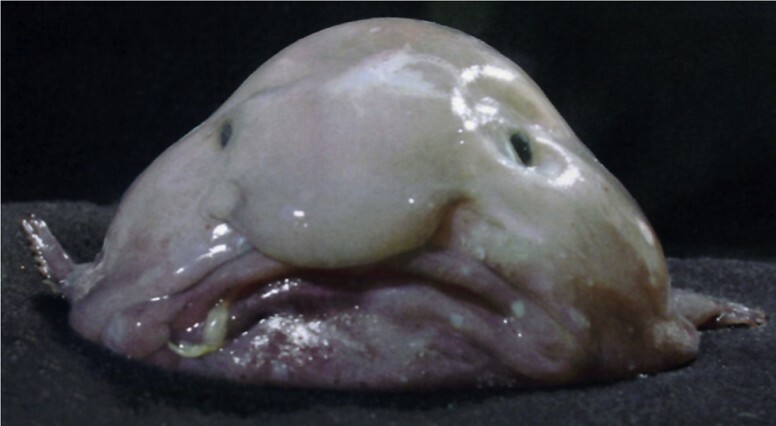 “Behold the Blobfish”, via Smithsonian.com.